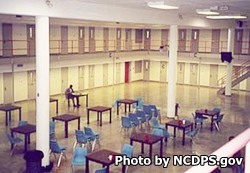 Nash Correctional Institution is located in Nashville North Carolina. It is a medium security prison that houses 512 adult offenders. Inmates are housed in single cells. Nash Correctional Institution participates in the Correctional Enterprise program that employs 120 inmates in a printing plant. This printing plant is responsible for printing the majority of publications for state government agencies. Additionally, the Correctional Enterprise program operates an optical plant that manufactures eyeglasses and employs 52 inmates. Other internal supportive jobs are open to inmates, allowing them to work in custodial work, landscaping, and food preparation for the facility. Nash Correctional Institution offers educational programs that allow the offender to earn a GED. Additional vocational training teaches inmates new skills they can use upon release for employment. All inmates have access to medical and dental treatment while incarcerated. All visits at Nash Correctional Institution are by appointment only. To schedule an appointment call (252)-462-4050 between Tuesday and Friday. You must schedule an appointment at least three days in advance. Visitation occurs Tuesdays, Wednesdays, Thursdays, Fridays, and Saturdays.